Jamie Wyeth has since adolescence attracted considerable attention as a third-generation American artist: son of Andrew Wyeth, among the country’s most popular painters, and the grandson of Newell Convers Wyeth, famous for his distinctive illustrations for the classic novels by Stevenson, Cooper, and Scott. 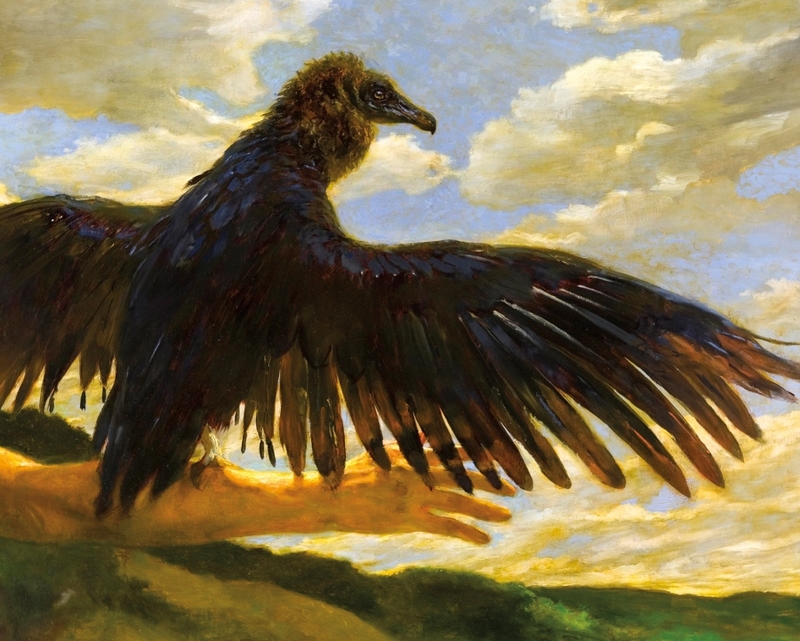 “Everybody in my family paints – excluding possibly the dogs,” says Jamie Wyeth. 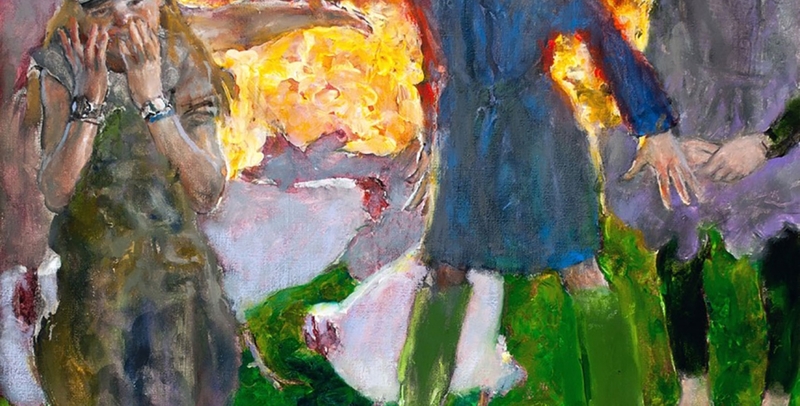 And non-human subjects are a common theme: long a sensitive observer of his rural surroundings, he paints livestock and other animals with the same care and intensity he devotes to portraits of people. He won precocious fame, in fact, with Portrait of Pig, his picture of a pink and white sow. The technical facility Wyeth showed even in his early work helps explain why his first one-man show in New York happened when he was only 20, and a retrospective in Omaha, Nebraska, occurred before his 30th birthday. James Browning Wyeth was born on July 6, 1946, in Wilmington, Delaware, just south of Chadds Ford, Pennsylvania, where he grew up and still lives part of each year. His mother is Betsy (James) Wyeth; he has an older brother, Nicholas. During childhood, Wyeth had before him the example not only of his father and grandfather but also two of his aunts, Carolyn Wyeth and Henriette (Wyeth) Hurd, and his uncles Peter Hurd and John McCoy – all painters. With pencils, brushes, and paints always at hand, the boy found it natural to use them to express his impression of a book he’d read or a movie he’d seen. He left public school after the sixth grade to be tutored at home so he could devote more time to art. Having acquired most of his own schooling from private tutors, his father didn’t consider a formal education necessary for an artist. After taking English and history lessons in the morning, Jamie Wyeth would go to his aunt Carolyn’s studio, where for the first year he was assigned to drawing spheres and cubes. Although bored by such disciplinary exercises, he understood their value. Indifferent to sports and games and undistracted by the social activities that would have claimed his attention in school, Jamie Wyeth spent at least eight hours a day studying, sketching, and painting. His natural talent developed under the guidance of his father, who in his own youth had the benefit of N. C. Wyeth’s instruction and encouragement. His father, he recalls, didn’t actually give him lessons, but rather let him work and then offered constructive criticism. By the time he was 18, Wyeth’s paintings hung in the permanent collections of the Wilmington Society of Art in Wilmington, Delaware, and in the William A. Farnsworth Library and Art Museum in Rockland, Maine – as well as in several private collections. He’d begun to paint portraits in oils, including works that still stand among his most powerful, such as Draft Age and Shorty. Wyeth examined all aspects of the appearance and character of the people he painted. For his portrait of Lincoln Kirstein, he required 200 hours of sittings by the impresario. True to his thoroughgoing approach, Wyeth studied anatomy one winter in New York by working every Saturday at a Harlem hospital morgue. But if he had the advantage of a celebrated family name, Jamie Wyeth also faced the immediate rejection of his work by some of the avant-garde critics who dictated the criteria for the New York art scene. Some lost no time in transferring their distaste for the traditional style and themes of Andrew Wyeth’s realistic canvases to the paintings of his son. While serving in the Delaware Air National Guard from 1966 to 1971, Wyeth was commissioned to paint a portrait of Charles L. Terry, Delaware’s governor, although he rarely accepts commissions for portraits. He was also persuaded by people close to the Kennedys to undertake a posthumous portrait of President John F. Kennedy. He familiarized himself with Kennedy’s appearance through photographs, motion picture footage, and talks with people who knew him, including several discussions at Hyannisport, Massachusetts, with the President’s widow. To get a sense of the living President, he made numerous sketches of his brothers, Robert and Edward Kennedy. In another departure, toward the end of the 1960s, Wyeth took part in Eyewitness to Space, jointly sponsored by the NASA and the National Gallery of Art in Washington – a program designed to record details of the United States space probes. As a participating artist, he covered both launchings and splashdowns. Another historic event that provided subjects for his drawings was Watergate: on trips to Washington from Maine in the spring, summer, and fall of 1974, he sketched incidents in the Senate and Supreme Court relating to Watergate developments, as well as the tense courtroom scenes in Judge John J. Sirica’s trial of John D. Erlichman and other defendants. Meanwhile, Jamie Wyeth’s work had become more widely known, having been shown alongside his father’s and grandfather’s at an exhibition in 1971 at the newly opened Brandywine River Museum at Chadds Ford, a handsome building had been converted from an old grist mill by the nonprofit Brandywine Conservancy formed to save the area from overdevelopment. A highlight of the show was the younger Wyeth’s meticulously executed Portrait of Pig, which spans seven by five feet. Wyeth has since created many other “portraits” of animals, ranging from Newfoundland (1971) to The Raven (1980). In 1973, the Brandywine River Museum showed 143 portraits by members of the Wyeth family, including painters who had married into it. Jamie Wyeth displayed a recently completed self-portrait, Pumpkinhead – Self Portrait, showing a scarecrow-like body topped with a grinning pumpkin. The Joslyn Art Museum in Omaha held the first full retrospective of his work in the winter of 1975-1976, when more than forty of his drawings, watercolors, and oils were exhibited. He drew further national attention with a show at the Coe-Kerr Gallery in 1976 of the portraits he and the late pop artist Andy Warhol did of one another. Like his father, Jamie Wyeth is able to evoke the character of a person without actually including them in a painting. Wolfbane (1984) is a portrait of his wife Phyllis Mills Wyeth, who has been the subject of many of his works. Here, however, she is not visible, but is represented by her hat, which hangs over the back of a chair. The delicately painted hat, with its highlighted white sash, suggest a feeling of gracefulness. Some of Wyeth’s one-man exhibitions have included those at the Pennsylvania Academy of Fine Arts (1980), Greenville Museum of Art, SC (1981), Amon Carter Museum (1981), Anchorage Fine Arts Museum (1983), State Museum, Alaska (1983), Portland Museum of Art (1984), Columbia Museum of Art (1984), Oklahoma Arts Center (1985), Farnsworth Art Museum (1993), Brandywine River Museum (1994) and Decatur House, Washington, DC (1995). Since 1969 Wyeth has served as a member of the advisory committee of the United States Postal Service. He designed one of the 1971 eight-cent Christmas stamps depicting the partridge in a pear tree of the English carol “The Twelve Days of Christmas.” Wyeth was commissioned by President and Mrs. Ronald Reagan to produce the official White House Christmas cards for 1981 and 1984. In 1994 the U.S. Mint commissioned Wyeth to produce a portrait of Eunice Kennedy Shriver for use on the 1995 Special Olympics World Summer Games Commemorative Coin commemorating her works with the Special Olympics. He volunteered his time and talent for the coin effort. The 1995 Special Olympics World Summer Games Commemorative Coin was the U.S. Mint’s largest selling coin in 1995. He also lent his support to lighthouse preservation efforts in Maine with his 1995 exhibition, Jamie Wyeth: “Island Light” and the unveiling of a limited, signed and numbered edition of Iris at Sea. Jamie Wyeth has illustrated two children’s books. The first, in 1979, The Stray, written by his mother, Betsy James Wyeth, and published by Farrar, Straus, Giroux. Cabbages and Kings, written by Elizabeth Seabrook, published June, 1997 by Viking Children’s Books, Penguin Putnam Inc. In June, 1997, The Terra Museum of American Art’s exhibition, N.C. Wyeth and His Grandson: A Legacy, exhibited his illustrations along with his grandfather’s. In 1972, Wyeth was appointed a council member of the National Endowment for the Arts. In 1975, he became a member of the board of governors of the National Space Institute. He is a member of the national Academy of Design and the American Watercolor Society. Jamie Wyeth holds honorary degrees from Elizabethtown College, 1975, Elizabethtown, PA, Dickinson School of Law, 1983, Dickinson College, Carlisle, PA, Pine Manor College, 1987, Chestnut Hill, Massachusetts, University of Vermont, 1988, Burlington, Vermont and Westbrook College, Portland, Maine, 1993. Wyeth’s works are included in many public collections, including those of the Terra Museum of American Art, National Gallery of Art, National Portrait Gallery, John F. Kennedy Library, Museum of Modern Art, Joslyn Art Museum, Farnsworth Art Museum, Delaware Art Museum, and Brandywine River Museum. Wyeth is a participating lender for the United States Department of State, Art in Embassies Program. In “Jamie Wyeth: Proteus in Paint” Joyce Hill Stoner said of Wyeth: Jamie Wyeth lives on his own terms with a healthy respect for his heritage and a unique ability to translate acute observations into a spectrum of visual experiences in an impressive range of styles from the laser-like intensity of Portrait of Shorty to the archetypal but ironic encrusted image of an animal friend in Portrait of Pig to the eerie painterly dreamscape of Comet. Ann Morgan, author of Oxford Dictionary of American Art and Arts, describes his style as one that follows the realistic style of his father, Andrew Wyeth, while venturing into “more psychologically fraught territory”. When making portraits, Wyeth sees into the nature of an individual and portrays them with such detail and realism that the shocked subjects “often hid them up in their closets”.